Here are two very different Fenway Park pictures inside the stadium. 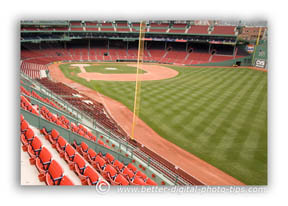 The first photo of Fenway Park was taken during a tour in the middle of the afternoon. I composed the photo to include the stadium seats in the foreground, the field in the middle ground, and the distant cityscape of Boston to create depth in the image. Creating depth in a photo gives your eye a path to travel from close objects to farther away objects. The stadium overhang blocked some of the light hitting the seats at the bottom of the photograph. This darkens the image near the bottom edge and creates a natural framing effect. That's a technique, which is one of the composition photo tips found in the Photo Composition tips article. The photo above was taken at twilight during a game. Notice how much more dramatic the sky is. You can get get great nighttime photos by getting the right balance of fading daylight and the light from electrically powered lights. Although the photo at the top is well composed and the exposure is good, it's an average photo. Shooting pictures of Fenway Park when people are present, makes it seem more alive. With the players on the field, the stands packed with fans, and the brightly lit field, you can almost hear the cheers and the crack of the bat. The pale blue press box is a big rectangular box that sticks out over the stands. I must agree that the press box is not a beauty from the outside. The view from the inside is good but there are very few creature comforts inside. The sold-out-difficult-to-get-tickets for the bleacher seats in right field really are not an ideal investment for great comfort and game viewing. The "Green Monster" is one of the most unique features of the ball park, but it's not a great photography subject anymore. The large green wall in left field has large, annoying advertisements attached to it now. One of my old college buddies says that Fenway is an overrated dump. 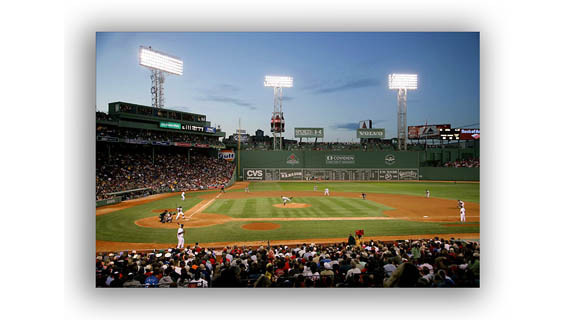 This photo of Fenway Park on the left illustrates two composition rules for photography or any other artistic composition as well. Notice how the dirt border surrounding the field leads us into the photo from the bottom right. That is called using a leading line. Additionally I used the Rule of Thirds in photography to decide where to place home plate in the photo's composition. The other photography technique I used was to include both something closer to the camera as well as something more distant. I used a wide angle setting on my camera to accentuate the vast distance it is from home plate to "home run territory", deep in the right field bleachers. 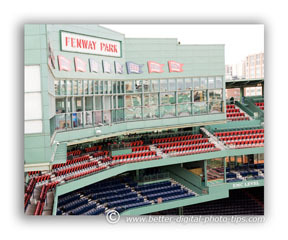 When you are taking Fenway Park pictures or any other, it always helps to know a few composition rules before you start taking photos. 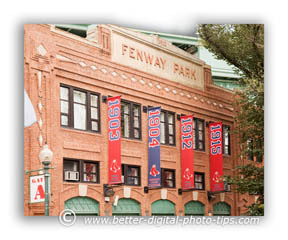 This photo of Fenway on the right was one that I had to take for personal reasons. When my mother was in high school, more than 60 years ago, she spent an entire summer in Boston and became a lifelong BoSox fan. This photo of the building's facade has an historical feel because of the brick design and the dates printed on the banners. 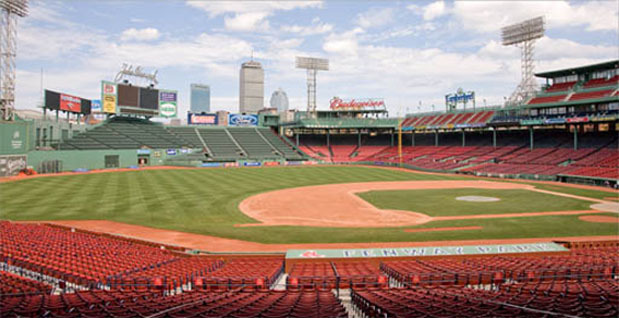 The first professional game at Fenway was actually played in April of 2012. The Sox defeated the New York Highlanders — later known as the Yankees — before 27,000 fans,7-6 in 11 innings. If you have an interest in other photos of Boston besides Fenway Park pictures, you might be interested in viewing Pictures of Boston. This is just one of a series of short articles that give tips for travel photography. 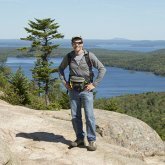 As I always like to remind my digital photo tips readers, remember to enjoy yourself and have fun as you discover the tips and techniques of taking digital photography.